I ran the London Marathon yesterday. Years ago, a friend asked if I’d ever fancied doing it before and I said no. That was partly because I thought I’d end up losing too much weight when there was already very little of me to spare, but mostly because I didn’t have the desire or motivation to take on such a big challenge. I was fortunate enough to be one of those people who hadn’t suffered enough to have a cause close to their heart. That was until 10 November 2012 when my thirty-three-year-old wife was struck and killed by a car in front of me and our then two-year-old son. In that moment, I tragically lost my best friend. And in the months that followed, I inadvertently gained a sense of purpose: I would aim to help other people, like me, whose lives had been shattered by loss. In the first instance, the people I wanted to somehow support were adults. As a father of such a young boy, I barely knew how to raise a happy child, let alone advise anyone on how to care for a grieving one – I had nothing to offer bereaved kids. I could, however, open up my world to grown-ups to help them see that they were not alone in their pain; I could articulate my grief in the hope that the empathy offered might somehow be received. But it didn’t take me long to figure out that as a husband who had lost his wife and a parent whose child had lost his mum, it was impossible to separate or isolate our states of bereavement. I realised that age mattered very little when it came to what we both craved. Man or boy, adult or child, perhaps what the bereaved need most is deep understanding, support, empathy and to be met without judgement from others. Age separates us immediately, intelligence and comprehension develops with time, but we all have feelings that can be hurt from the moment we are born. How do you sufficiently attend to the feelings of another when you are hurting so badly yourself, though? Sometimes, I believe, you need support. That’s why I turned to others for help with my son. I could strive to be the best father in the world but no man can ever hope to have all the answers. I made a decision to seek out the advice of experts, embrace their help, learn from their practices and pass it all on to the adults that I can reach through what I write. That decision, I believe, has changed my life and, I pray, will make my son’s happier. Yesterday, I contemplated all of this as I stood in a park full of people waiting anxiously to embrace the task of running just over twenty-six miles across England’s capital. I felt both a buoying sense of awe and a heavy sense of woe as I considered the many heartbreaking motivations that inspired so many thousands of runners to take on such a gruelling test of human endurance. Surely it’s the hardship that so many of us have lived through that will make completing this race possible, I told myself as I stood with my friend on the start line. Twenty-three miles later I heard him say, ‘This is the hardest thing I’ve ever done.’ Another runner heard him and agreed, ‘I’ve never been in more pain,’ he added. I have, I thought. And it’s not the hardest thing I’ve ever done, either. The hardest thing I’ve ever done is told my two-year-old son that he’ll never see his mummy again. He’s three-and-a-half this week and, despite having now reiterated that same message countless times, I still really don’t know if he understands the gravity of the situation quite yet. But because of the help I receive from people who have been there before, I’m confident that I’m doing the very best I can for him. And because of all of the support so many people have offered through the sponsorship of mine and my friend’s run, I feel confident that other broken-hearted parents will be able to do their very best for their bereaved children, too. There’s still time to contribute if you can. Just go to www.justgiving.com/lifeasawidower or text DESB79 £2 (or any other figure you can afford to type after pound sign) to 70070 to support Grief Encounter, a charity that offers support to bereaved children. And for those who have already given, Jackson and I would like to thank you from the bottom of our hearts. You’ve made a huge difference to our lives in more ways than I imagine I could ever explain. Congratulations on completing the race and I totally understand when you say it is not the hardest thing you have ever done. Those of us who have lost a loved one and raised a young child at the same time, know that is much harder! I connect with you since I too took my job as a single parent so seriously – I would have no matter what but when my husband died, I somehow felt without even identifying it immediately that I had to do it right for his father’s sake. I too was blessed to have family and friends help me although I wish social media and the online resources available today would have been around in 1990! YOU are a gift to your son. What a lovely, caring father you are. Well done. Like I mentioned elsewhere well done Ben I watched a bit of the start of the marathon hoping I would catch a glimpse of you ready for the race, unfortunately I had to leave to go to church. I salute you for daring to take up the challenge of running the 26 miles yet reading your post I sense that you loved every bit of it because for you it is about doing something to help your charity but above all for your love of Desreen and Jackson no wonder difficult as it may have been but it was worth it because of the bond between you and your late wife. Anyone who has followed your blogs is amazed by the depth of love which you have for your late wife. I have no doubt that Jackson will understand what love is about as he watches all you do to keep your late wife’s memory alive. Every photograph of you and Jackson is eveidence that you are doing a great job in bringing him up. He is blessed to have you. I am glad I was able to support you during the marathon. First of all, congratulations on completing the marathon! Eight months ago, my brother lost her wife as suddenly as you did. She had a heart attack in front of my parents’ home, on her way to a shopping mall. She was only 41 years old and, as far as we knew, she was perfectly healthy. It was september 11th. So far from New York, my brother had his own terrible 9-11. They had a eight year old child. My nephew is now nine and his birthday on february was only one of the many difficult moments we have experienced. Happily, as happened in other occasions, he didn´t realised it because all the family succeeded on hiding our sorrow from him. This has been a constant task to be fulfilled. Christmas, New Year’s, my brother’s birthday, and we are about to face the first Mother’s Day without her. My brother is fighting day by day, and I see a lot of him in your words. I guess that´s why I´m writing to you. He started running just a few months after her death and he has told me it really helped. He says that, when he’s running, his mind is empty because he is focused on the act of running. I believe he is, in fact, meditating. So, thank you for sharing your experiences. I’m sure you, as well as my brother, are both in the right track to live a long and happy life with your sons. Greetings from Brazil!! 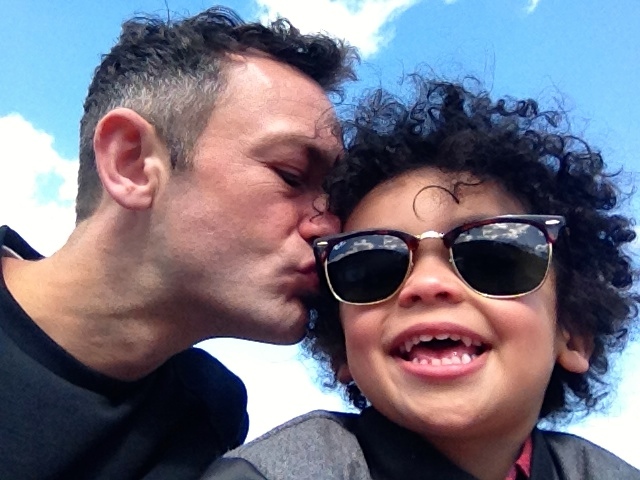 This entry was posted on April 14, 2014 by Ben Brooks-Dutton and tagged bereavement, child bereavement, children, Desreen Brooks, grief, Grief Encounter, kids, life as a widower, lifeasawidower, London marathon, loss, toddler grief, toddlers, widow, widower.